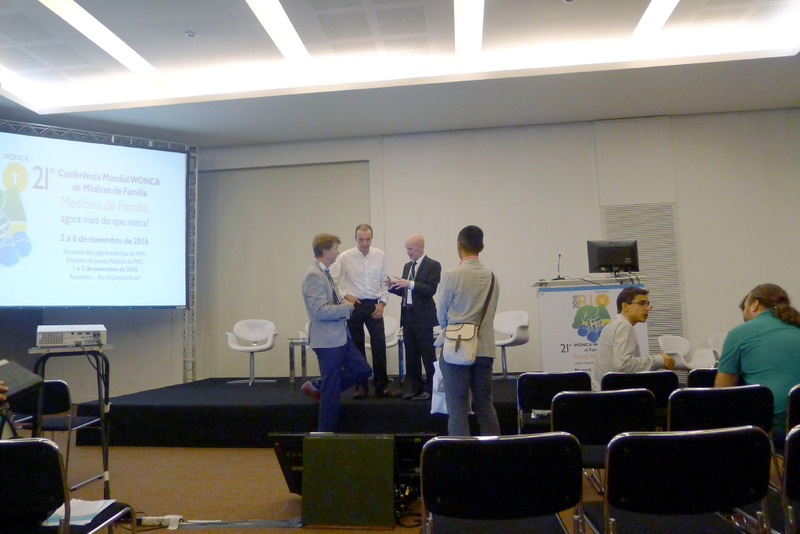 Our director, Andy Law, travelled with Dr Alec Logan to Rio de Janeiro to present a symposium on Architecture and Primary Care at the World Conference of WONCA (World Organisation of Family Doctors). The audience came from such diverse places as Brazil, Sweden, the UK and Japan. The one and a half hour event focussed on the importance of architecture in primary healthcare, exploring the cultural and strategic health/social care context alongside the benefits of providing excellent space. We are delighted to see the external envelope is now complete for the National Centre in Inverclyde for sportscotland – just 8 eight short months since Morrison Construction started to dig the foundations. The ambition is to complete Phase 1 (the building fabric) before the end of the year and we are impressed with the general progress and pace on site. The redevelopment of this centre will enable the facility to be recognised across the Scottish sporting landscape as the benchmark venue for fully-inclusive, residential, sporting activities – providing an inspirational place to experience sport and deliver an integrated, safe and secure environment where athletes and coaches can focus on their sport development activities throughout their stay. 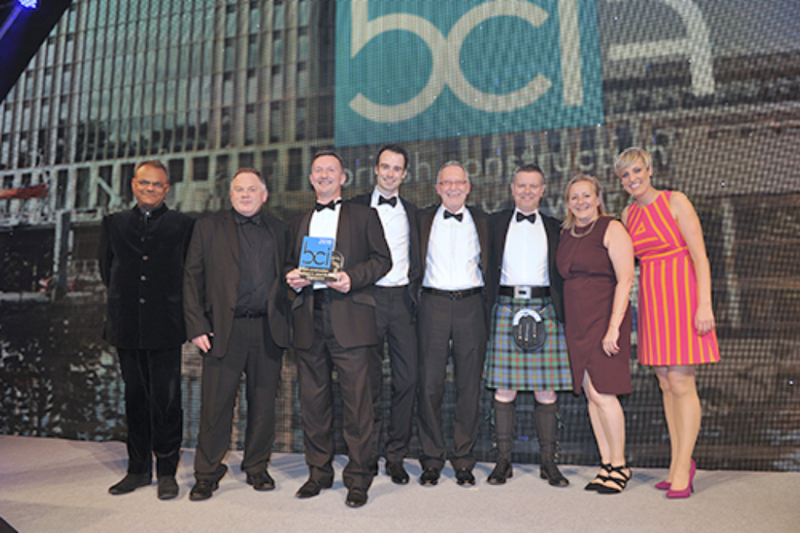 We are delighted to have won a British Construction Industry Award for the City of Glasgow College, Riverside Campus. The BCI Awards recognise excellence in its broadest sense – the overall design, construction and delivery of buildings – and are highly regarded in the construction sector as among the most rigorously judged awards in the industry. “This impressive building with an amazing internal atmosphere has transformed marine teaching opportunities in Glasgow. …not us, unfortunately, however we were honoured to be included on the shortlist with such esteemed company and have really enjoyed the process. It has been especially rewarding to take part in the wider discussions this award generates. We were extremely lucky to have a highly engaged and collaborative client group whose energy and commitment to the project went substantially beyond professional obligation and we would like to thank them for the opportunity. Hopefully our combined contribution to Glasgow will become a valued and loved part of the city. Congratulations to Caruso St John and their Newport Street Gallery – the project is beautiful. 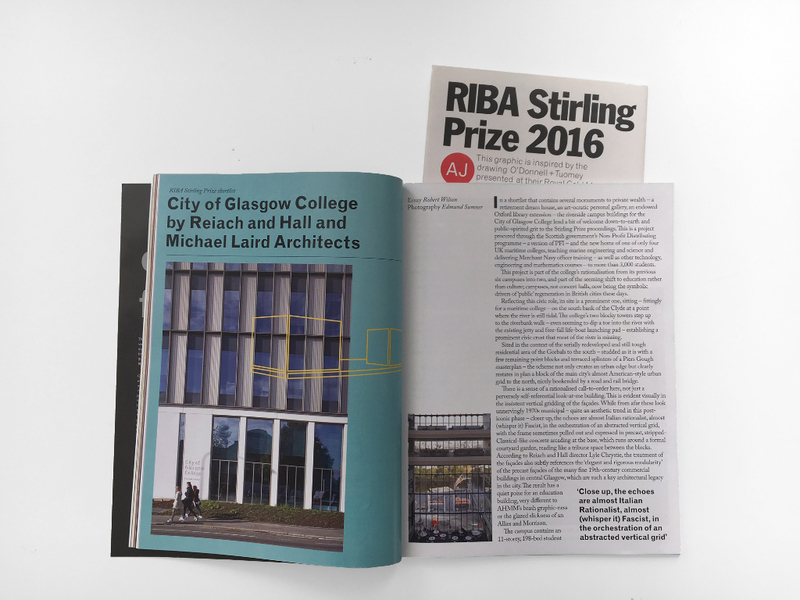 The Architects Journal continued the momentum in the build up to the RIBA Stirling Prize announcement by visiting our City of Glasgow College, Riverside Campus and interviewing the team on the design. The video was produced by Jim Stephenson with a Q&A led by the AJ’s architecture Director Laura Mark. The short film is a great representation of the college and gives the AJ readers a fantastic insight into the design process, the brief and the building itself. 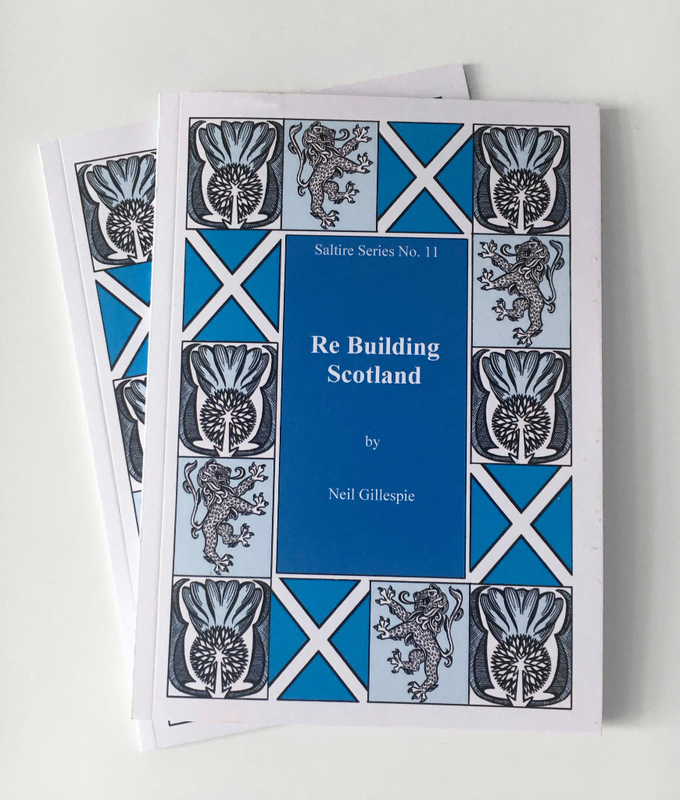 In the Year of Architecture, Design and Innovation, which coincides with the Saltire Society’s 80th anniversary, Neil Gillespie was invited to prepare a Saltire Society pamphlet. Neil used the Saltire Society’s 1941 publication Building Scotland as his starting point. Published during the war, Alan Reiach and Robert Hurd’s book looked to a future where good architecture would be an intrinsic part of Scottish civic society. The post-war void would be filled with the clean lines of new hospitals and social housing. While there was much hope and optimism for the built environment, many of the buildings disappointed. Even today architects are still hamstrung by restricted budgets and short lead times, argues Gillespie. With little time allowed for design development it is small wonder that so many buildings lack the refinement and style that Reiach and Hurd hankered for. This text provides an insight on what’s wrong with so much of modern architecture: from its uniformity to its reliance on system-built prefabrication, from the threat globalisation imposes on all things local and distinct to the curse of the “starchitect”. Reiach and Hall Architects have been appointed to fit-out the new level 9 shell space formed under the over-cladding project at Appleton Tower, University of Edinburgh. This new space for the School of Informatics is intended to provide new meeting spaces for commercialisation which in turn releases level 6 for the re-configuration of teaching accommodation. 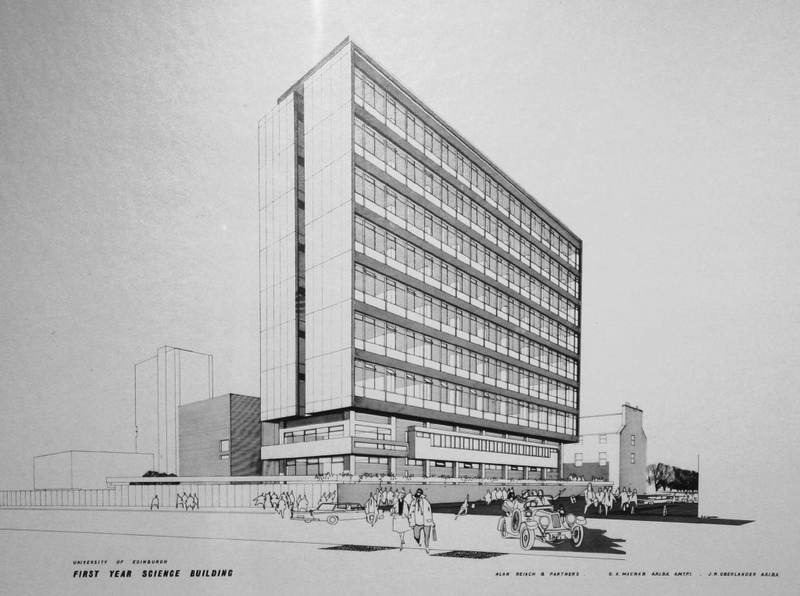 Reiach and Hall designed Appleton Tower in 1963 and it was opened in 1968. 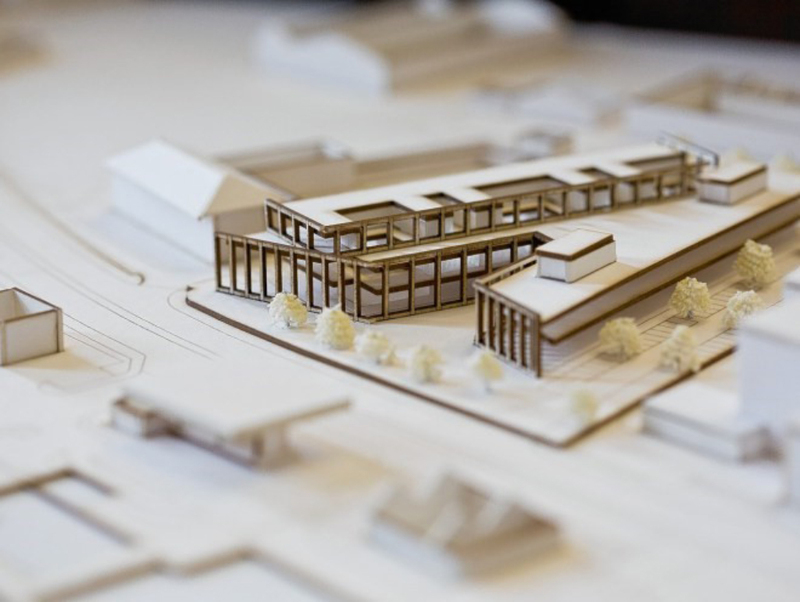 Reiach and Hall have revealed designs for the Inverness Justice Centre as part of a public consultation exhibition. “This is a very exciting development and unique in its vision to bring together a range of organisations who work within the justice environment in the Highlands. With financial support in place from Scottish Government, the Inverness Justice Centre is a fantastic opportunity to improve the delivery of justice within a purpose-built fully integrated facility. The exhibition was also attended by Cabinet Secretary for Justice, Michael Matheson, and forms part of the pre-planning application. The RIAS have revealed the shortlist of the top ten Scottish buildings from the past 100 years, chosen from a 100-strong list published back in March. 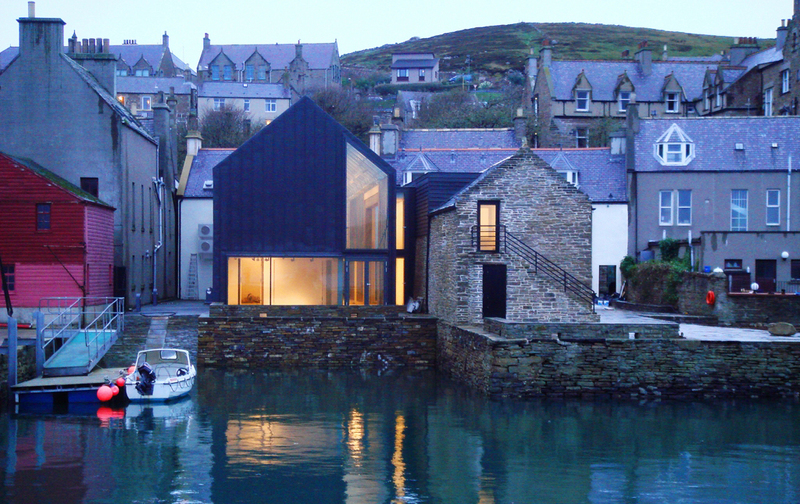 We are thrilled that the list includes our Pier Arts Centre building in Orkney which was completed in 2007. The Top 100 was launched as part of the RIAS’s 2016 Festival of Architecture and all buildings are featuring in a major touring exhibition called Scotstyle. 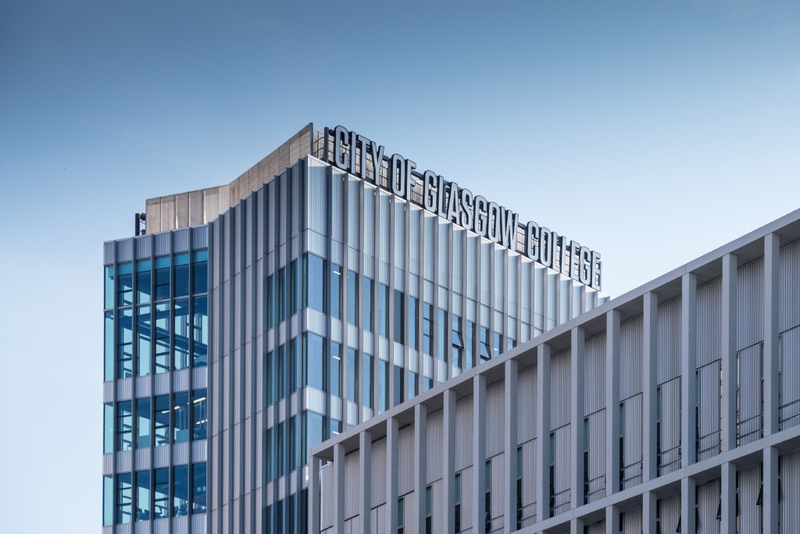 The City of Glasgow College has been nominated in the PAN Category – Health, Safety and Wellbeing – as part of this year’s British Construction Industry Awards. This award seeks to recognise project teams that understand the importance of creating a safe and healthy working environment that promotes the industry as one that is attractive and welcoming to all. The judges have looked for specific projects on the overall shortlist that demonstrate industry leading commitment to improving workforce health and safety and wellbeing. We have recently submitted planning for the refurbishment of the Jack Kane Centre in Edinburgh. 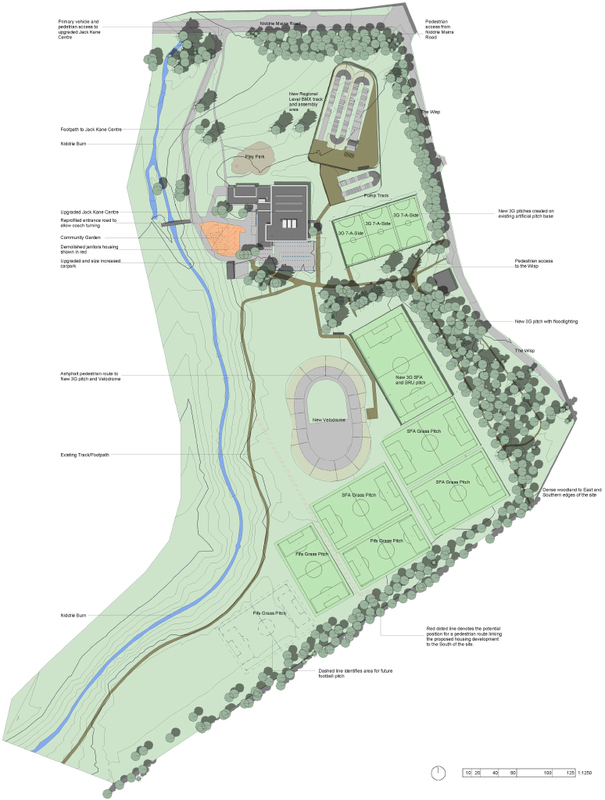 Proposals, prepared for City of Edinburgh Council, include the addition of a new Olympic sized 250m outdoor velodrome and a regional level BMX facility, at Hunters Hall Park in Edinburgh, together with the re-covering of the existing artificial pitch and the addition of a new 60m x 40m artificial pitch. The Jack Kane Centre itself, constructed in 1975, will be upgraded to meet the expectations of its users – improving the existing services within the building and allowing flexibility for modern equipment. Reiach and Hall Architects would like to congratulate Takahiro Iwasaki on being selected as the artist that will represent the Japan Pavilion at the 57th International Art Exhibition of the Venice Biennale which opens on 13 May 2017. Takahiro is a former student of Reiach and Hall’s artist friend and collaborator Alan Johnston – studying ‘Arts Space and Nature’ as part of a Master of Fine Arts at Edinburgh College of Art. 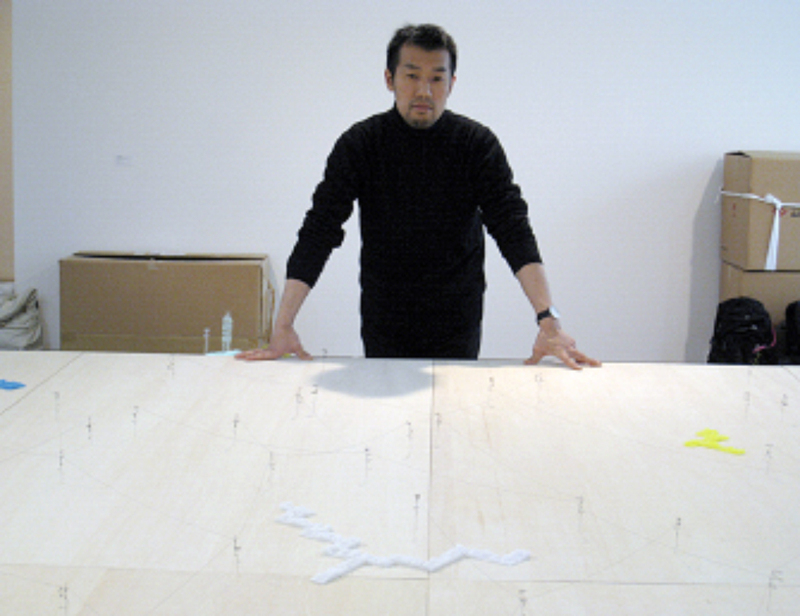 In 2005, Takahiro exhibited in our gallery, sleeper, as part of a collective work in his degree show year. This Edinburgh / Japan connection is truly wonderful and extremely important not only for us at Reiach and Hall, but also for Scotland in general. We will continue to nurture these connections initiated by the collaboration of artist Alan Johnston and our design director Neil Gillespie in our sleeper gallery – bringing to Edinburgh a rich diversity of national and international art. We look forward to seeing Takahiro’s intervention at the Japan Pavilion as he aims to create an exhibition that highlights the interesting aspects of the pavilion’s unique architecture, in an interactive manner. Reiach and Hall were thrilled to collect an RIAS Award for our City of Glasgow College Riverside Campus at this year’s Royal Incorporation of Architects in Scotland (RIAS) Awards ceremony. The RIAS announced 11 Regional award winners representing the very best of Scottish Architecture. 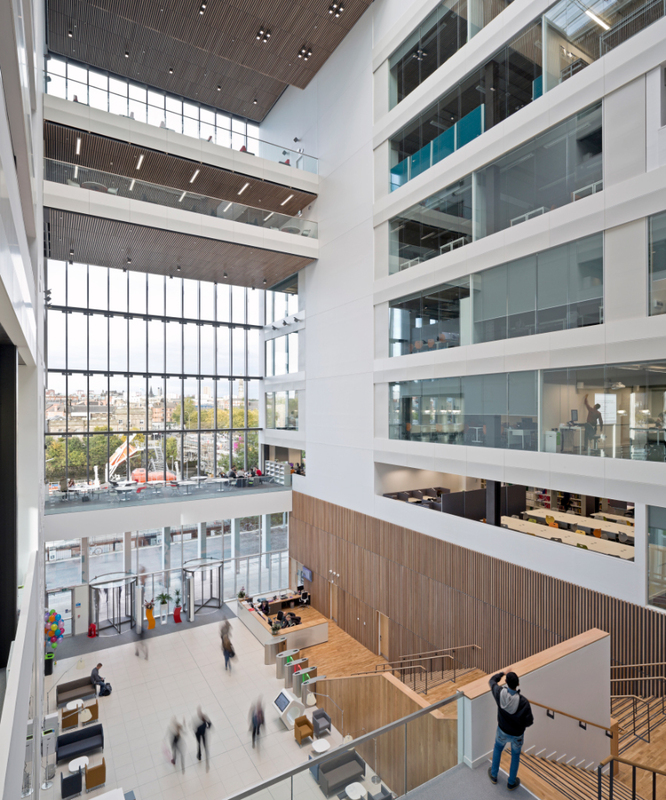 The Riverside Campus is phase one in a two campus project for The City of Glasgow College (completed as a Joint Venture with Michael Laird Architects). Phase two, The City Campus on Cathedral Street, is due to open in the autumn. Riverside will now move forward to be considered for the RIAS Andrew Doolan Best Building in Scotland Award. We are delighted to see the ongoing transformation of our City of Glasgow College, City Campus – as it nears completion later this summer. 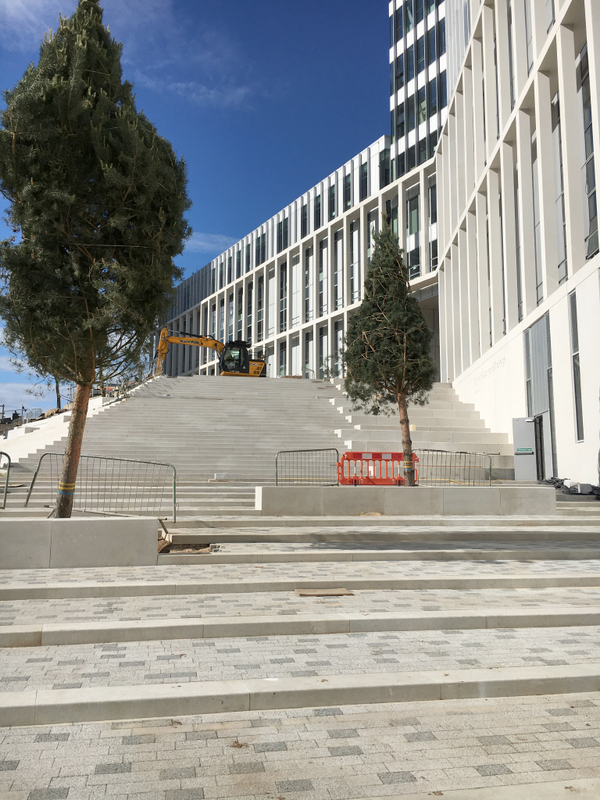 At the moment landscape works are almost there and the true scale of the campus is beginning to be revealed as it connects to the city and to Cathedral Street. The internal courtyard gardens are also planted with mature trees and plants that should be well settled before the college move in August. 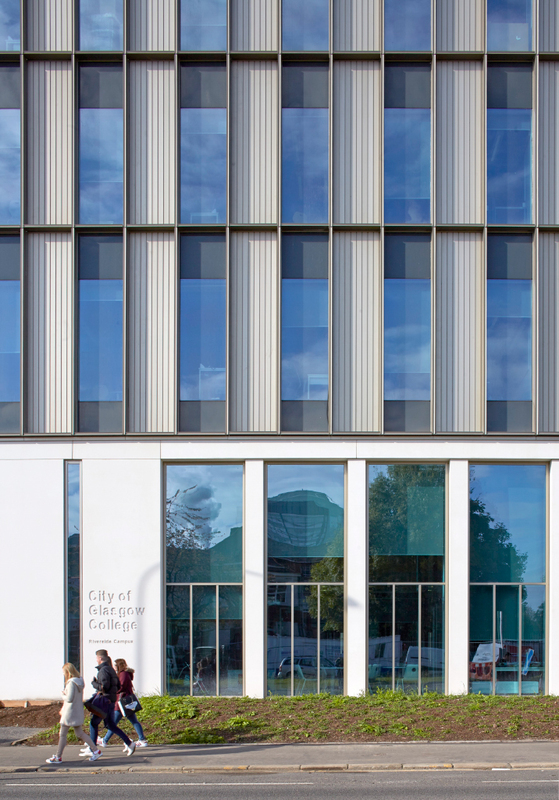 The City Campus is Phase 2 in our overall City of Glasgow College project and provides specialist teaching facilities as well as a City Market which opens onto Cathedral Street – providing shop fronts for bakers, butchers and fishmongers. A new commercial hair salon will also welcome clients on level zero and specialist fabricators are currently installing a bespoke aircraft cabin for cabin crew training – the first of City Air Fleet. We are also really excited to see the completion of the TV production studios, 16 kitchens/bakeries, lecture theatres and construction hall. 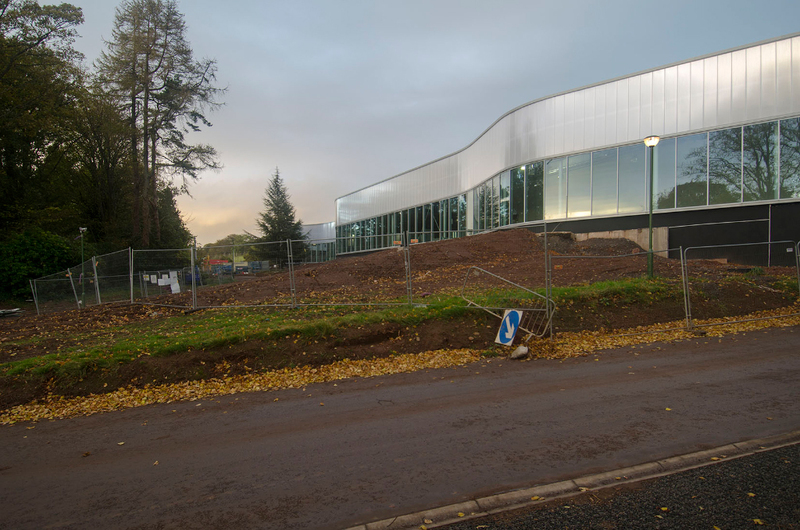 Work on site at The National Centre at Inverclyde for sportscotland is progressing quickly – allowing us to see our ambitions of the ribbon façade develop through the landscape and tie the scheme together. The building will eventually provide 60 fully adapted residential rooms, sports facilities and support services in an inclusive sports environment – benefiting the community, athletes and sports governing bodies – as the first of its kind in the UK. At the moment the primary focus is on constructing the external envelope with the installation of windows, curtain walling, composite panel and roofing well underway. Internally, all floor slabs have been cast, the internal partitions and first fix services installation commenced within the residential accommodation. The building’s form and the façade’s rhythm is now visibly evident on site, transformed from a structural frame. The volume of the internal spaces are beginning to emerge revealing their scale, quality and relationship with the landscape. 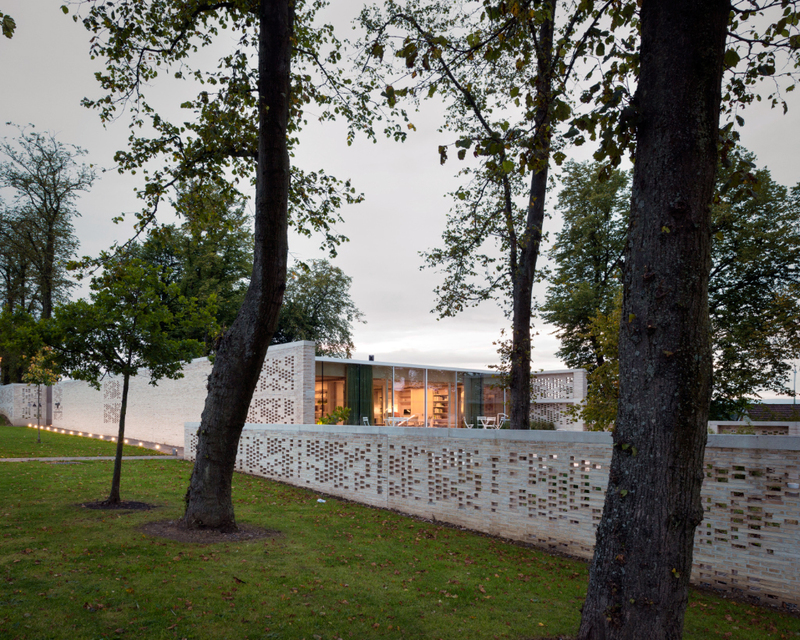 Our Maggie’s Cancer Caring Centre in Lanarkshire has reached the long list stage of the WAN (World Architectural News) Awards. The WAN Healthcare Award is a major international competition. It is the largest award of its kind, attracting entries from all over the world, promoting the best in pioneering Healthcare design. The WAN Healthcare Award 2016 champions human-centred designs that enhance the visitor experience, maximise operational efficiency and help to improve patient outcomes – whether a hospital, clinic, care home or surgery. We are delighted to be part of the judging process which continues until July 2016. The City of Glasgow College has won Project of the Year at the British Institute of Facilities Management (BIFM) Scotland Awards. 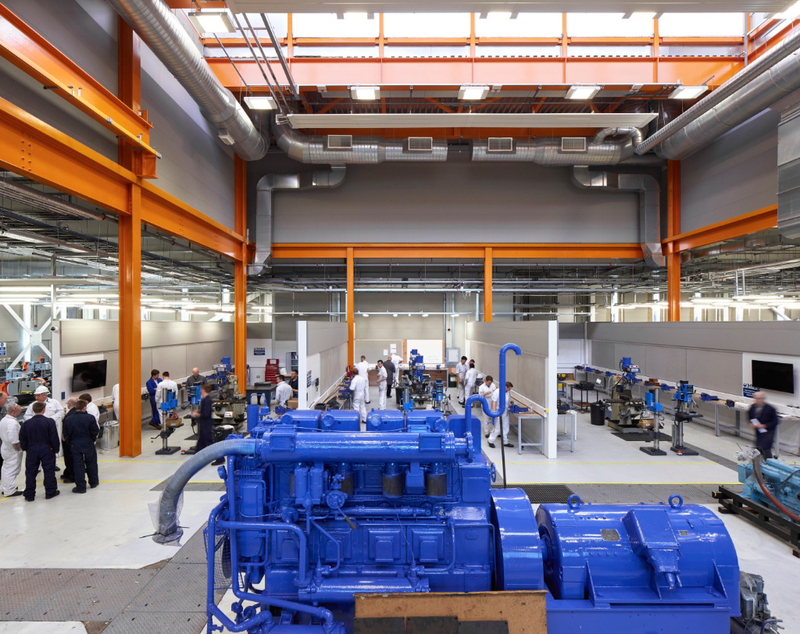 The Project involved the move into Riverside campus with the award recognising the sheer scale of Facilities Management delivery which involved all areas of soft and hard facilities management and migration. The college mobilised not only the estates and facilities team into new surroundings, but all staff into the new Riverside campus. 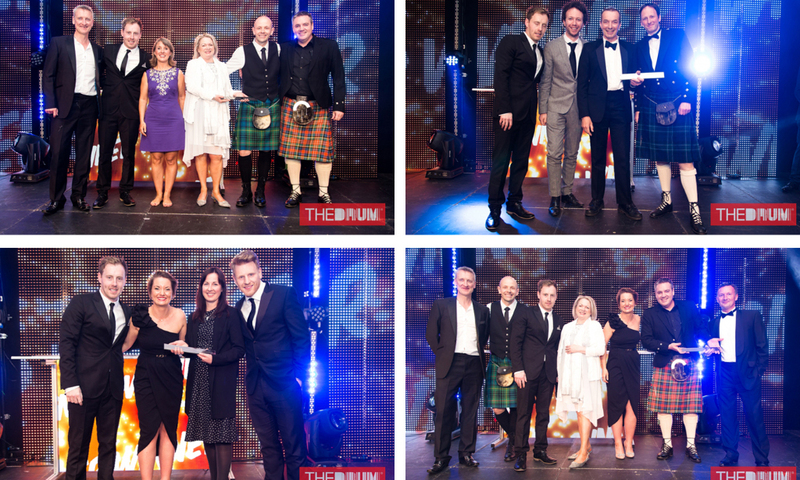 The BIFM Scotland Awards recognise outstanding performers in facilities management. Reiach and Hall have submitted planning proposals to replace the existing two storey link building between the Lister and Pfizer building at Edinburgh University. 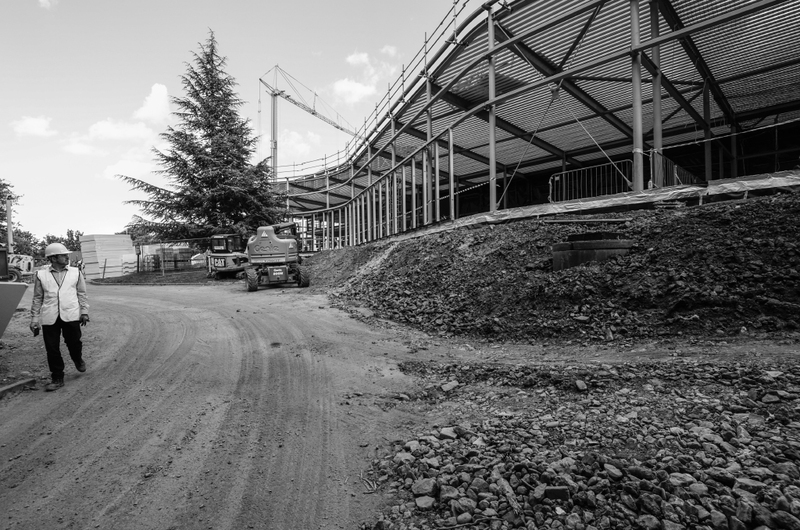 The new link will provide a new teaching facility connecting the existing buildings, as well as secure cycle racking, a refuse store and an external stepped and ramped entrance. The internal spaces will allow for free circulation between the Lister and Pfizer buildings and address issues created by the multitude of levels to the existing buildings, stitching them together more effectively than the current link building. 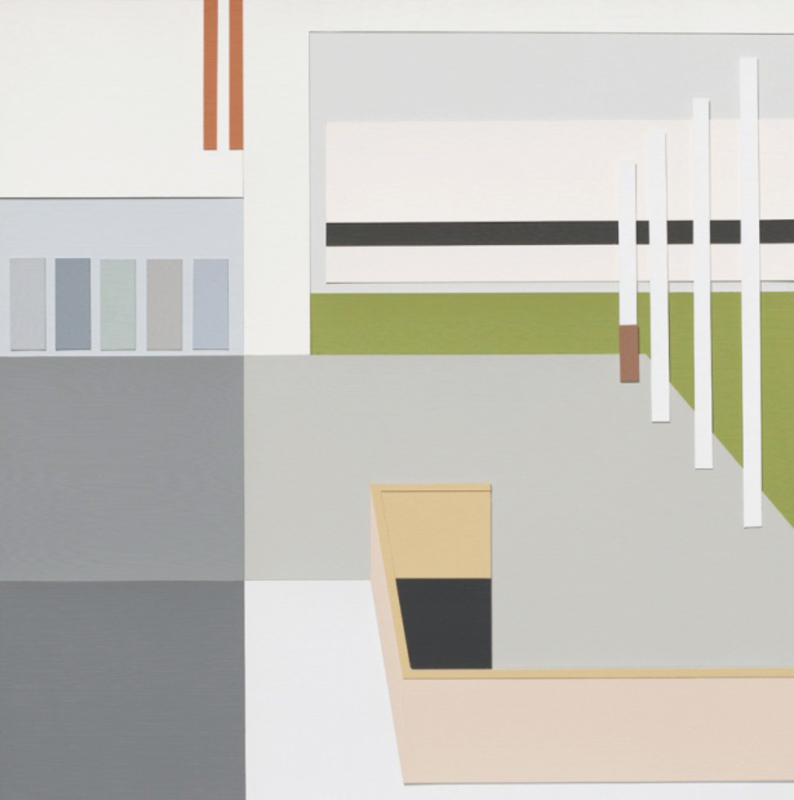 An exhibition which explores the potential of colour to modify space and the way in which buildings are perceived will open at the AA in early November. This exhibition accompanies the book ‘Colour Strategies in Architecture’ which was a research collaboration between the Haus der Farbe, Zurich and the University of Edinburgh. Reiach and Hall Architects are delighted to be feature as one of the six different strategies presented – in a collection of examples from 20th and 21st century architecture in Berlin, Zürich and Edinburgh. ‘Hushed Tonalities’ investigates Reiach and Hall’s work and looks specifically at Forth Valley College, Stirling and The Battle of Bannockburn Visitor Centre. The exhibition will run from 12/11/2016 to 16/12/2016. Congratulations to rankinfraser landscape architects on making the shortlist for the 2016 Landscape Institute Awards. The awards are presented annually to encourage and recognise outstanding examples of work by the landscape profession – aiming to promote the art and science of landscape architecture; advance the knowledge and understanding of the discipline; celebrate the professional expertise; and reward schemes that demonstrate a high level of commitment to sustainability. The winners will be announced in November 2016. The alternative jury was made up of the AJ’s architecture editor, Laura Mark, Invisible Studio founder Piers Taylor, developer Martyn Evans and ex-AOC participation specialist Daisy Froud. 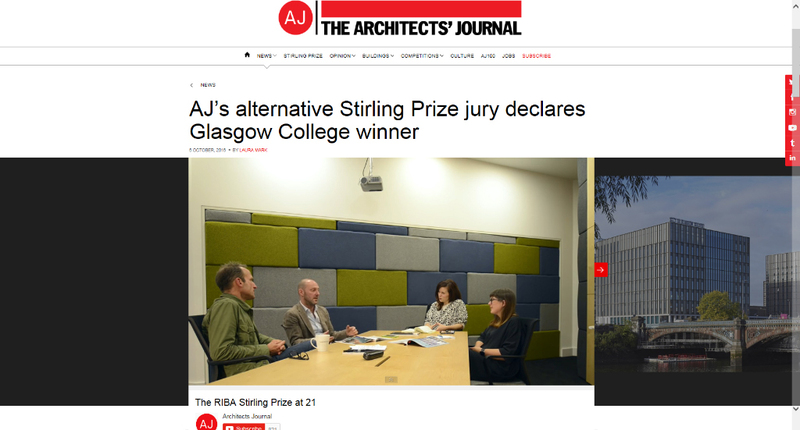 Together they visited all six buildings on the shortlist, and in a special feature documentary on the Stirling Prize at 21, our City of Glasgow College Riverside Campus was named as the alternative jury’s winner! "When you really understood the story of how it got made, what an immense amount of work the architects had to do, you felt the institution was being challenged by the building, but in a way that felt very natural." "The client could have just got a middle-ranking practice which could have just given them a commercial building, and they would have been quite happy. Every move beyond just giving that client an ordinary building was driven by the architect." 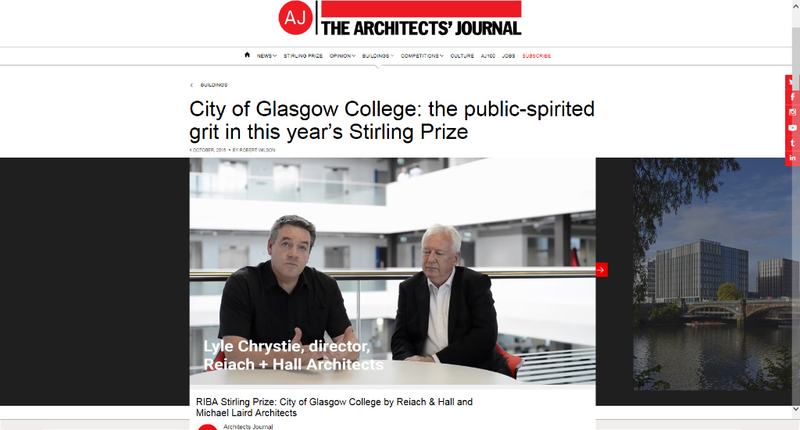 The ongoing RIBA Stirling Prize coverage continued with features on the BBC online – this included a short video interview at our City of Glasgow College, Riverside Campus with Lyle Chrystie, Reiach and Hall’s director, and Brendan Diamond of MLA. 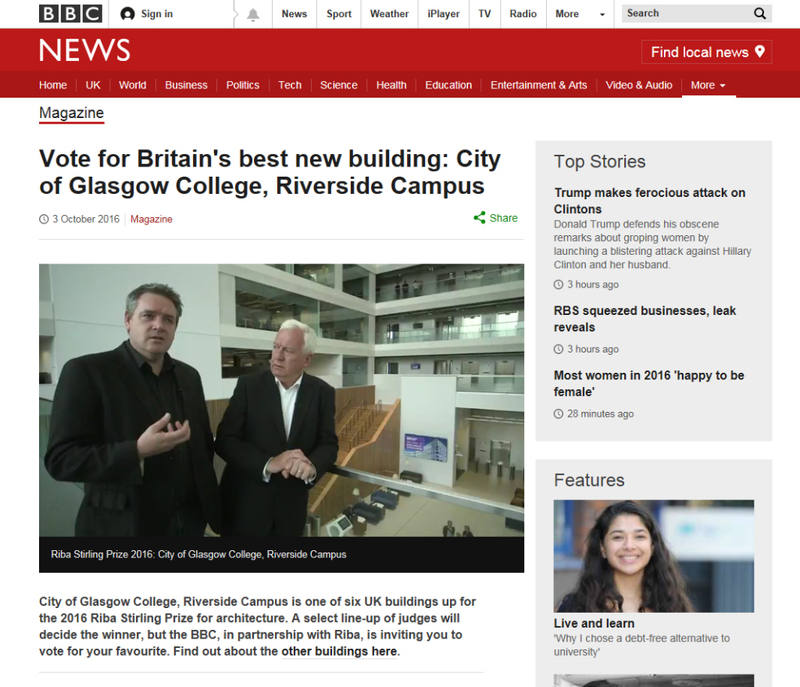 The BBC also initiated an online public poll to test opinion on the result – the Riverside Campus received 19% of the vote and came third overall this year. As we move towards the autumn, SNBTS moves ever closer to completion. It’s exciting to see the parkland setting – designed by Rankin Fraser – being sculpted out of what until recently was a huge muddy spoil heap and materials storage area. It will be grass seeded and planted with mixed woodland helping anchor our building to its site and will make a great amenity space for SNBTS’s staff when complete. 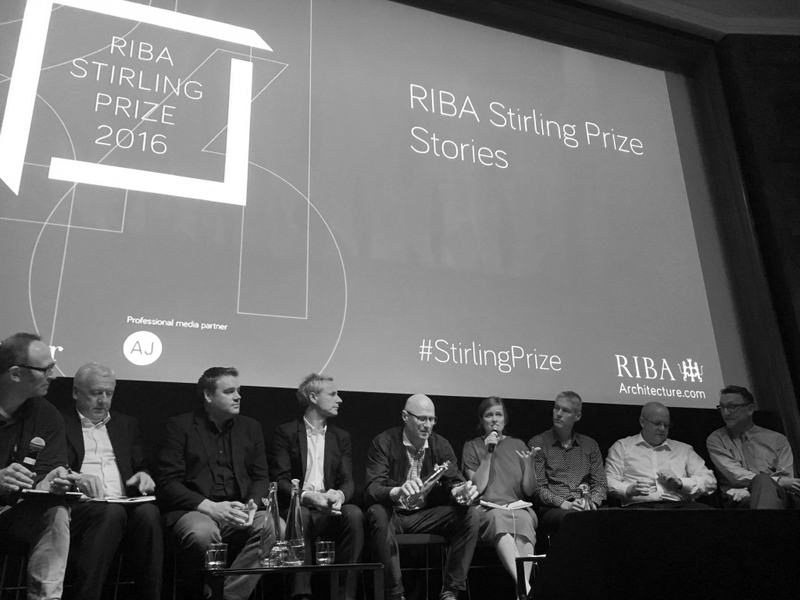 The ‘RIBA Stirling Prize Stories’ was a unique event where all the RIBA shortlisted practices came together to reveal the stories behind their buildings, the things that inspire them, and what it would mean to win the UK’s most prestigious architecture prize. Chaired by Simon Allford, director of AHMM who won last year with Burntwood School, the event gave each shortlisted practice a 10-minute slot to present the key ideas critical to the design of their nominated building. Lyle Chrystie spoke on behalf of Reiach and Hall and discussed the ideas of the City of Glasgow College and its relationship to the city and civic life. 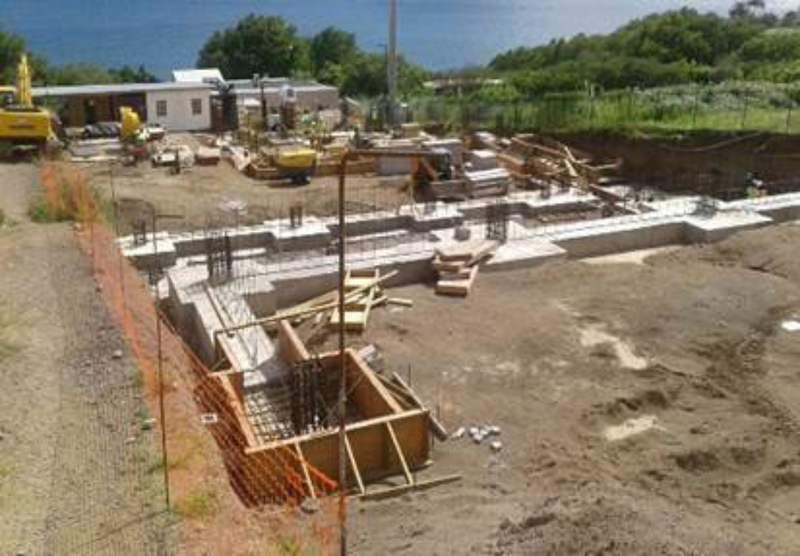 Work has now begun on site for the New Research Building in St Kitts, West Indies. The facility is located within the existing campus on the island of St Kitts and will contain three main components – research with biological laboratory accommodation and support facilities, a necropsy with post mortem examination facilities capable of handling large animals and a vivarium capable of housing animals up to the size of cats. The project is due for completion September 2017. 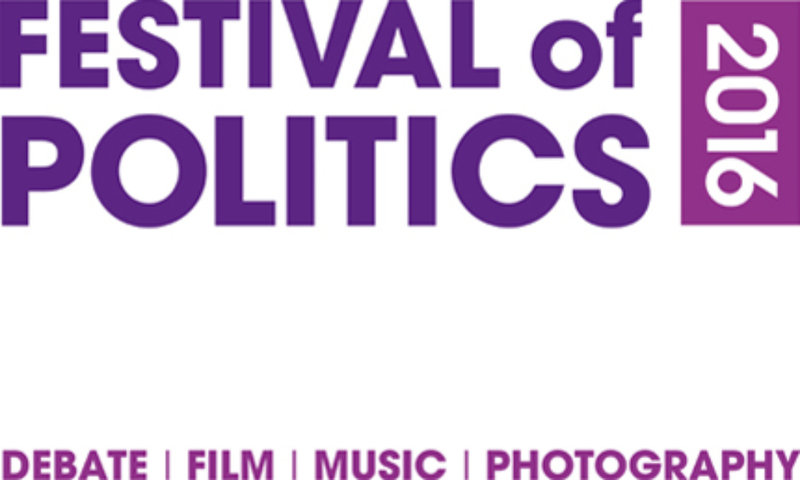 Reiach and Hall’s design director, Neil Gillespie, took part in a Festival of Politics 2016 panel discussion on “Healing Architecture” at the Scottish Parliament – alongside Professor June Andrews, Andrew Anderson, Lesley Palmer Parliament – in partnership with the Festival of Architecture 2016. The initiative of the Maggie’s Centre was used to discuss the ethos of how architecture really can help improve people’s experience of healthcare. The debate also covered what architects, health providers and designers are doing to meet the challenge of one million people living with dementia in the UK. We are delighted to announce that our Oriam project was handed over this month and it swiftly opened to the public. 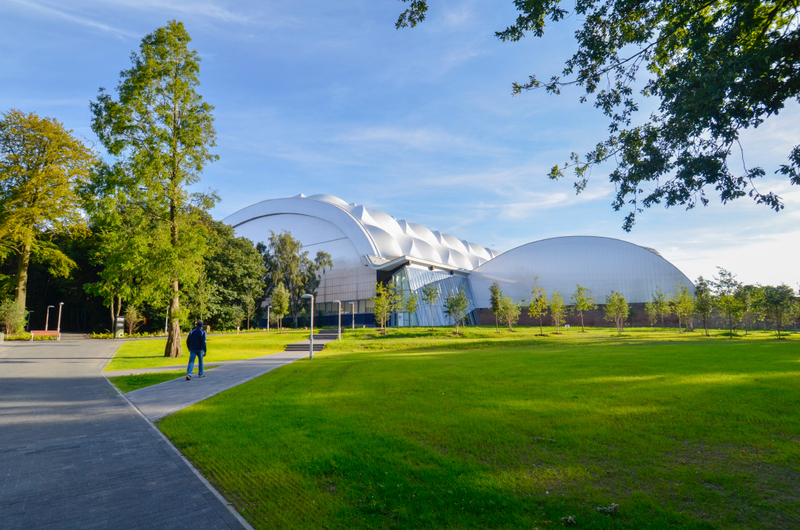 This new sports performance centre, in the grounds of Heriot-Watt University, is designed to provide Scotland’s athletes with the facilities, access and support services pivotal for international success. The project realises a partnership with sportscotland, Heriot-Watt University and the City of Edinburgh Council and was delivered by Bowmer & Kirkland. We are pleased to announce that we are shortlisted for the 2016 Building Awards for Building Magazine Project of the Year, sponsored by Scheuco. 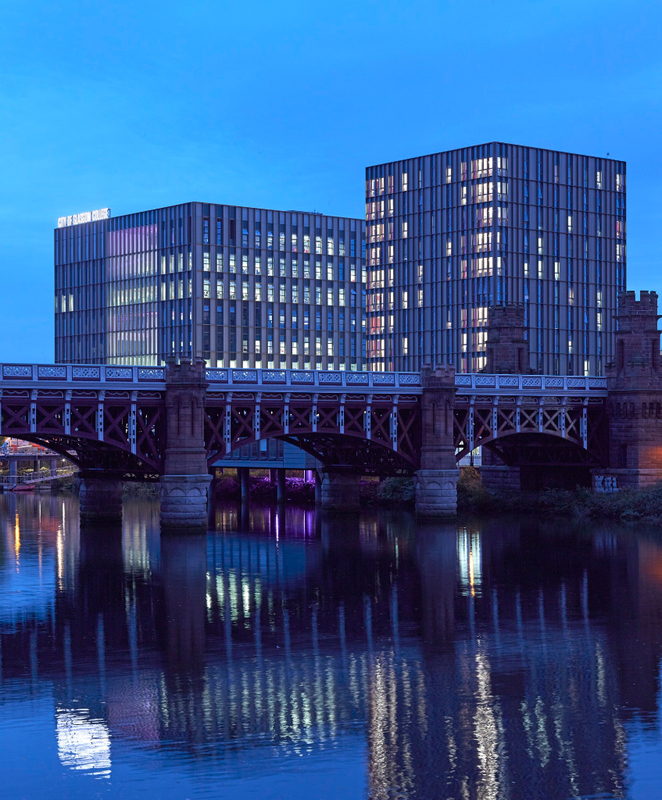 Our City of Glasgow College Riverside Campus (completed in August 2015, with MLA) is also currently shortlisted for the RIAS Andrew Doolan Best Building in Scotland Award, the RIBA Stirling Prize, the British Construction Industry Best Building between £10-£50m and the RICS Grand Final. We are overwhelmed by the response to this project and would like to thank our peers for the continued recognition. The results of the Building Awards will be announced in early November. We are delighted that our Maggie’s Cancer Caring Centre Lanarkshire has been shortlisted for the 2016 WAN Healthcare Award as one of six distinctively diverse projects from around the world. The WAN Healthcare Award is the largest award of its kind, attracting entries from all over the world by offering an opportunity to gain recognition and exposure and promote the best in revolutionary Healthcare design. The Healthcare Award distinguishes human-centres designs that enhance the visitor experience, maximise operational efficiency and help improve patient outcomes – whether a hospital, clinic, care home or surgery. This winner of this international competition will be announced online on 5 July 2016. 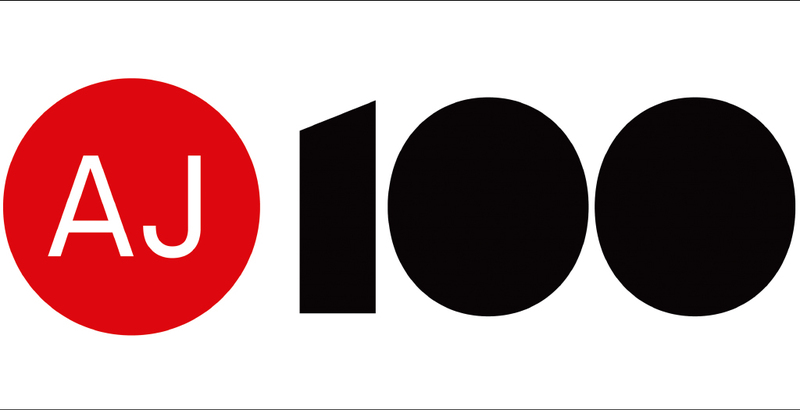 The AJ100 – a yearly survey which covers fees, salaries, sectors and markets in UK architecture practices – has been released, measuring the number of qualified architects per practice. Reiach and Hall Architects are delighted to be ranked number 77, with a note from the editors that we are ‘the keystone of the Scottish architectural scene’. We are excited to see the scaffolding down at our SNBTS building – a new National Centre for the Scottish National Blood Transfusion Service – marking the end of an exciting and busy month. 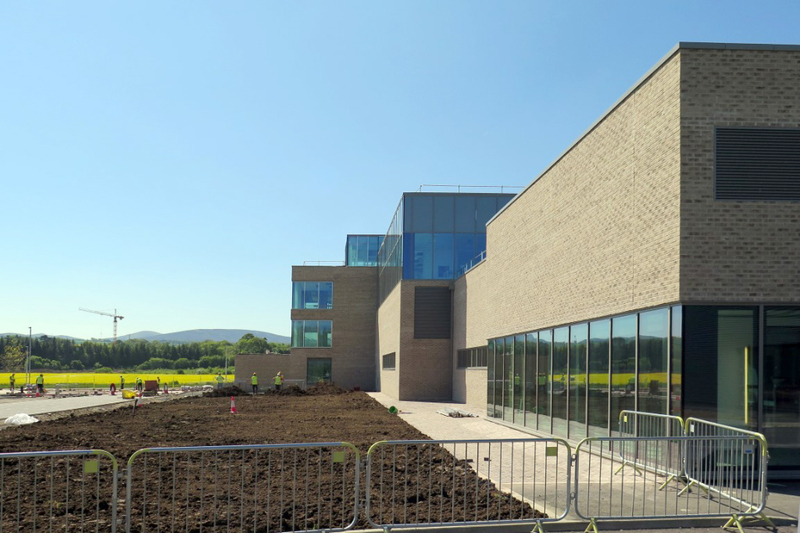 For the first time we have been able to appreciate the full composition and proportions of the brickwork and glass alongside views which have been closed off for months – across the fields and to the Pentland Hills. It is also great to see new light flooding into the building and animating the spaces. 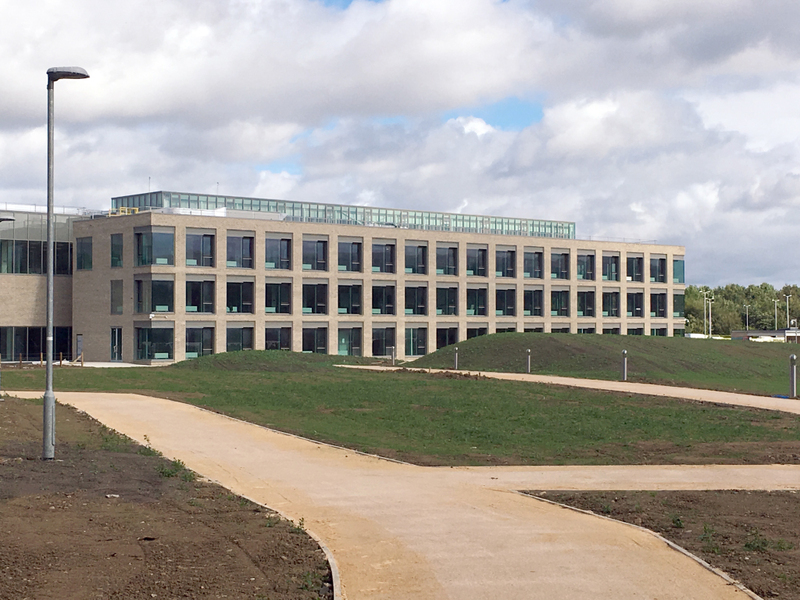 We’re looking forward to the completion of the landscaping that’s currently ongoing and are grateful of the efforts being made in the closing weeks by Interserve Construction and their teams of subcontractors – it is beginning to show excellent results. Reiach and Hall’s director, Andy Law, has been invited to speak at both the WONCA Europe and WONCA World Conferences this year. WONCA Europe is the academic and scientific society for general practitioners in Europe – it has 47 member organisations and represents more than 75,000 family physicians in Europe. This year the conference will take place in Copenhagen from 15-18 June when the 5 Nordic countries – Sweden, Norway, Finland, Iceland and Denmark – will welcome delegates and key-note speakers for numerous lectures, workshops, symposiums and oral presentations. The conference will highlight the issues of major importance to international primary care and draw on the best scientific knowledge to actively improve the ongoing development of the health care system. WONCA World – ‘The World Organisation of National colleges, Academies and Academic Associations of General Practitioners and Family Physicians – is now in its 21st year. The 2016 conference is planned for Rio de Janeiro from 2-6 November, just a couple of months after the Olympic Games. Andy will share his invaluable knowledge of the sector in a symposium entitled ‘Architecture in Primary Health Care’ alongside Dr Alec Logan – a Glasgow graduate and full-time GP in our Wishaw Health Centre. 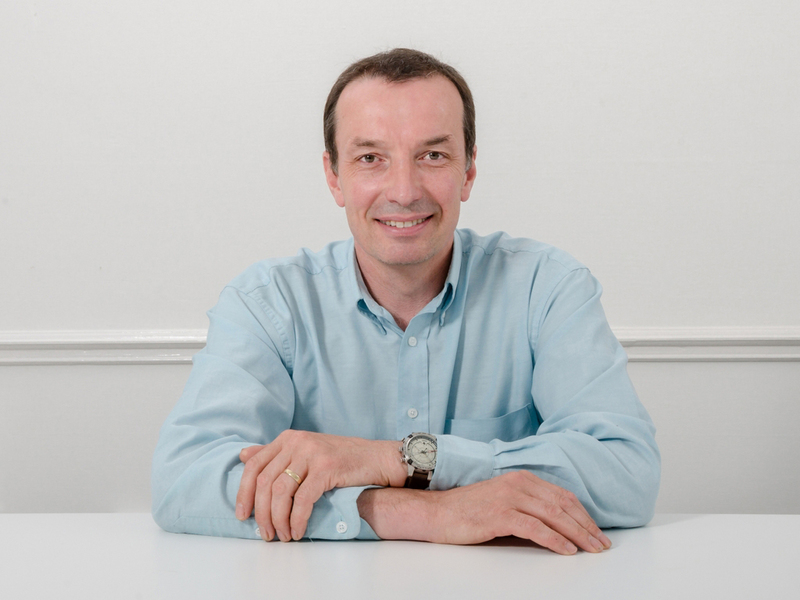 Alex created Rocket as a West of Scotland Faculty newsletter, hoolet for RCGP Scotland and the Back Pages of the British Journal of General Practice, which he edited for almost 15 years. Reiach and Hall were delighted to attend the Scottish Design Awards 2016. It was a great night for the practice, with our nominated projects collecting a total of four awards. Our Oriam project, for sportscotland, Heriot Watt University and The City of Edinburgh Council picked up the award for Future Building – a category designed to reward buildings that are currently under construction. NHS Lanarkshire Health Centres, in East Kilbride, Wishaw and Kilsyth, picked up the award for Health Project of the Year. 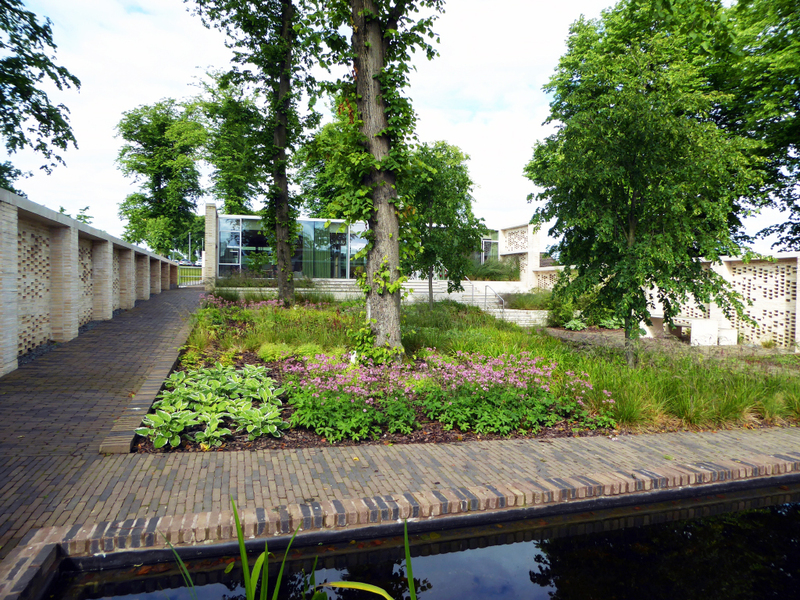 Maggie’s Cancer Caring Centre in Lanarkshire won the Landscape Award with rankinfraser landscape architecture. City of Glasgow College, Riverside Campus collected the award for Public Building of the Year. The City of Glasgow College, Riverside Campus (designed in collaboration with Michael Laird Architects) also received the Architecture Grand Prix. 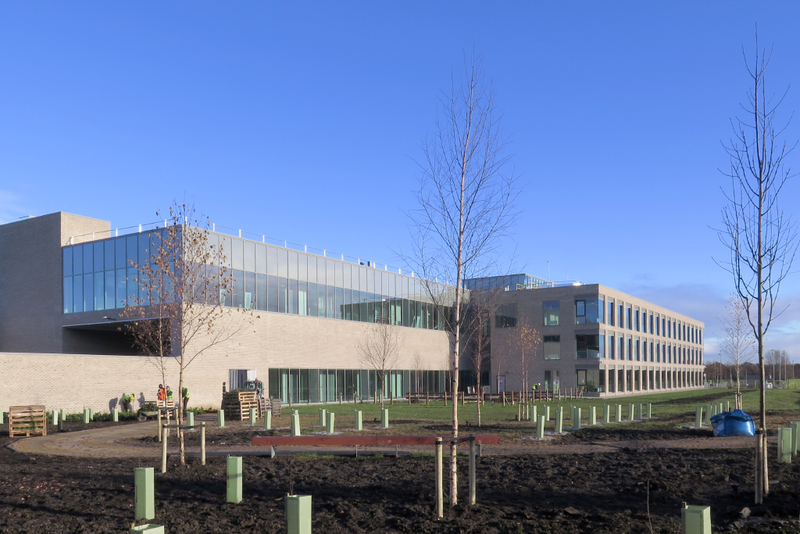 Work at our Scottish National Blood Transfusion building continues as Interserve and Balfour Beatty concentrate on the commissioning of the complex building services that support the main laboratories. The highly demanding and exacting procedures to verify and validate the laboratories continue apace to meet stringent regulatory standards. The contracted lab furniture and equipment is now installed. Other key spaces are being finalised in readiness for fit out. These include the staff café fitted out by Reiach and Hall in conjunction with NHS’s in-house Aroma brand and the open plan offices with fit out by Reiach and Hall and furniture supplied by Langstane. The 50m long by 4m high artwork by artist Steven Aalders has just received approval to proceed to manufacture by Norsign. We’re very excited at the prospect of this signature work moving one step closer to completion. Congratulations to Team Reiach and Hall, who ran the Men’s Health Survival of the Fittest 2016. 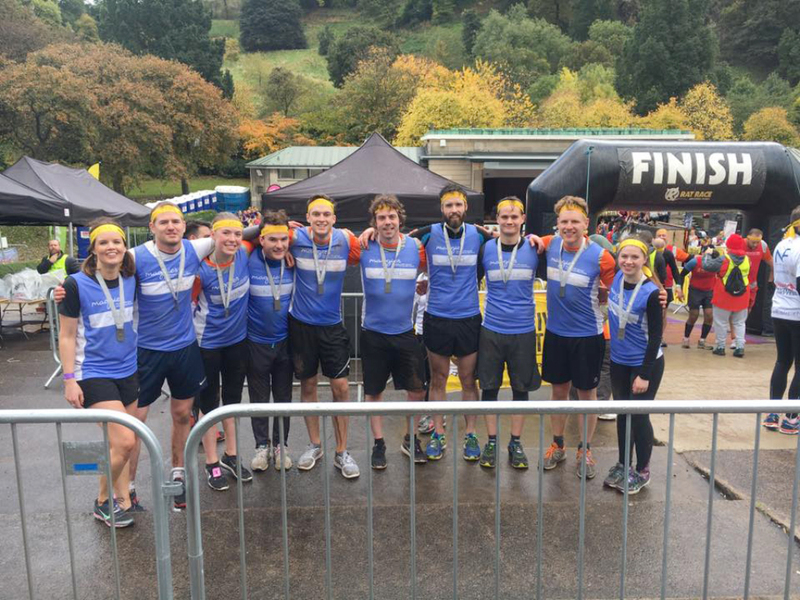 The 'urban adventure race' was set around the streets of Edinburgh and involved a 10KM city based running route which was punctuated with 10 unique and challenging obstacle zones – each themed to test meticulous survival standards! The R&H team was made up of David Dalgleish, Sarah Wilkinson, Stuart Kennedy, Douglas McCorkell, Wynne McLeish, Lewis Thomson, Charles Riach, Neil Brady-Campbell, Hannah Pritchard, Daniel Cardno and Kata Bota ... running to raise money for our Maggie’s Cancer Caring Centre in Lanarkshire. The RIBA Stirling Prize announcement has brought with it as series of professional reactions on the Architects Journal website – giving architects the opportunity to respond to the judges’ decisions. "Many congratulations to Caruso St. John, it looks a very accomplished and considered work, beautifully detailed and executed as you have come to expect from such talented architects. My commiserations to Reiach and Hall and Michael Laird but also my congratulations for they have managed to produced something extraordinary, despite a restrictive design and procurement process. Without such committed and dedicated architects, The City of Glasgow College could have and probably would have been standard stuff, instead Glasgow has and exceptional new building on the Clyde riverfront that the city can be proud of." "I think the best building won, which in the end must be the point about the Stirling Prize but I can’t help feel sad that the broad-shouldered toughness of the City of Glasgow College did not get the gong!" "The Stirling shortlist pitted some very disparate but highly accomplished and exceptional buildings against each other. Choosing a winner was never going to be easy. Caruso St John’s Newport Street Gallery is a beautifully crafted and sensitive tour de force worthy of the prize and no real surprise. My personal favourite and stand out winner however was Reiach and Hall’s City of Glasgow College simply because it has gone beyond the creation of beautiful architecture and transformed a place." "An excellent choice, almost a conservative one, but curiously in the light of other ‘luminaries’ comments on the nature of baked goods being boring and only big shape making being cool. This is reassuringly rebellious! Glasgow College is fabulous, and the Weston Library is a subtle tour de force, but Newport is simple but delicious - an English Rich Tea among the sparkly Viscounts." For the second year in a row, Reiach and Hall Architects have been delighted to feature in the Architects Journal special Stirling Prize edition. This is the AJ’s most anticipated issue of the year – providing a profile of each of the six projects shortlisted for the UK’s premier architecture prize with commentary, architects statements, materials boards, drawings, details and data. Last year, the RIBA Stirling Prize celebrated 20 years and the AJ special edition showcased our Maggie’s Cancer Caring Centre in Lanarkshire. The 2016 edition has details of our City of Glasgow College, Riverside Campus (completed with Michael Laird Architects) – we are delighted to have the opportunity to be part of the AJ’s publication. Our design director, Neil Gillespie OBE, was again part of the RIBA Honours Committee, responsible for selecting the 2017 Fellows as well as the winner of the annual RIBA Royal Gold Medal. 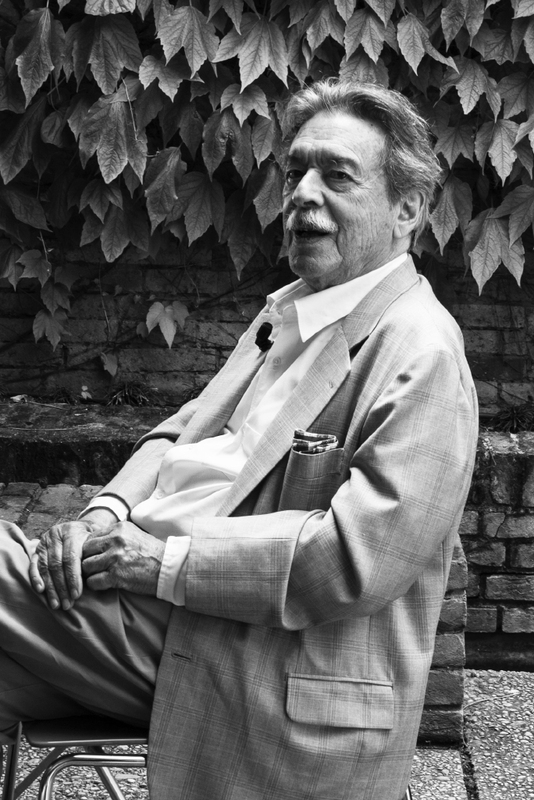 Neil’s nomination was for Paulo Mendes da Rocha, Brazil’s most celebrated living architect; and we are delighted that Paulo was selected and will receive the 2017 Royal Gold Medal. 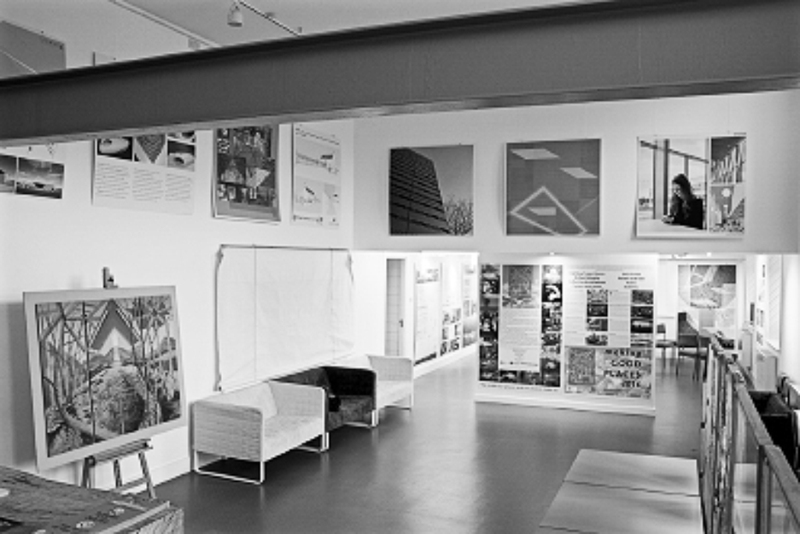 "Paulo Mendes Da Rocha has created a body of work, spanning six decades that has consistency, resonance and strength. Indeed it could be argued in today’s culture which is blinded by celebrity and profit that his work is of even more significance and relevance. His work has a courage and clarity that few can match. His structures are daring and joyous. His use of concrete bold and innovative. His plans at a building scale or at a city scale are generous and expansive. He is passionate about people and society and how his buildings might serve them. These remarkable qualities are present even in his earliest works. There is a quality to his work that renders it timeless. For many he represents one of the last great figures in architecture whose work, while serving society, has a poetic dimension that delves deeply into our architectural discipline." 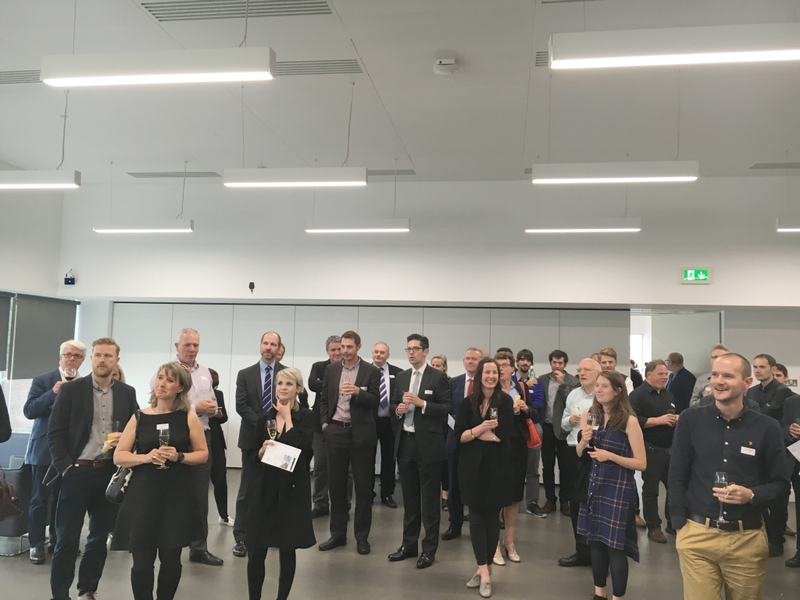 Staff, clients and colleagues came together at ORIAM to celebrate the completion of our latest sports building – designed to provide Scotland’s athletes with the facilities, access and support services pivotal for international success. Oriam is located in the parkland setting of Heriot-Watt University’s extensive campus in the west of the city and includes: an outdoor synthetic pitch; five outdoor natural football and two rugby pitches; 12 court sports hall; a full-size indoor 3G pitch; a café and a fitness suite; and world-class facilities for sports science and medicine including a hydrotherapy facility. The new facilities complement the refurbished facilities based at Heriot-Watt’s campus which include: eight squash courts; two new exercise studios; a four-court sports hall; sports performance laboratory; and a 60m x 40m indoor 3G synthetic pitch. 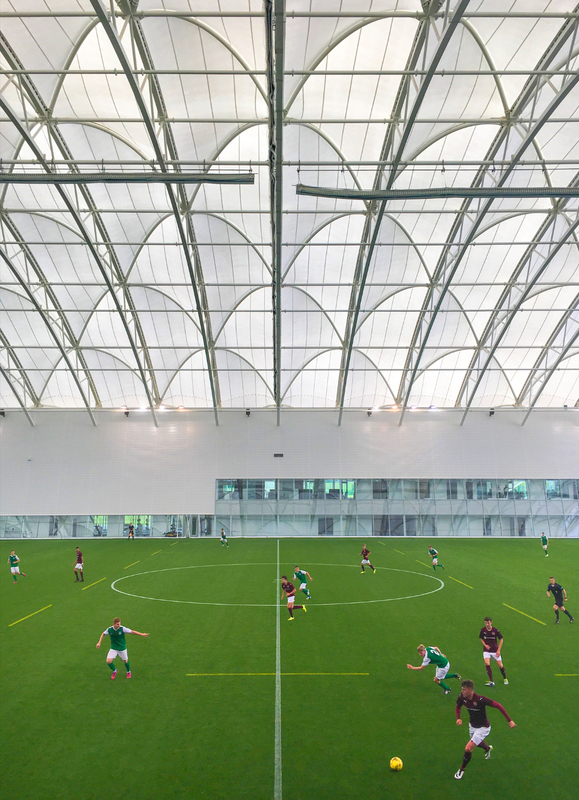 The indoor pitch in the new Oriam facility measures 116m x 76m with a playing height of 28m in the centre. It is the largest facility of its type in Europe. The new City of Glasgow College, City Campus, has opened to new and returning students in time for the academic year 2016-2017. The new building is equipped with state-of-the-art facilities which include TV and radio studios, an aircraft training cabin, 16 professional cookery kitchens, creative design and photography studios, industrial-sized construction, craft and built environment area; there is also a fine dining restaurant and a city market with butchers, bakers and fishmongers which will be open to the public. Although the City Campus is in operation for staff and students, the actual project will not complete until the autumn of 2017 because of additional works which involve the completion of demolitions, external spaces, landscaping and parking facilities. The first ever competitive goal in Oriam was scored yesterday by 17 year old Jamie Gullan of Hibs in the 14th minute of the first ever real game on the indoor pitch. A volley from 12 yards into the bottom left corner. Despite Hibs twice taking the lead, Hearts pulled it back to 2-2. Oriam is the home ground for Hibs U20’s this season with all of their home games being played in the building. We are delighted that the City of Glasgow College Riverside Campus has been nominated for the 2016 Prime Minister’s Better Public Building Award – an award that recognises publicly funded construction projects that are completed on time, on budget and bring real change to the community. Understanding that studios are full of creative work that never sees the light of day. Making Good Places is an exhibition which allows eight architects to explore the qualities of good places. The show aims at opening up the creative process, to give an insight into how good places are made. It also explores good places through examples of well-crafted cultural and community spaces, and their context. Featured designers include Reiach and Hall Architects, Richard Murphy Architects, Garber James, Snøhetta, Gaia Architects, Icosis and Malcolm Fraser. We are delighted to find ourselves on the Stirling Prize 2016 shortlist, for the second consecutive year, with our City of Glasgow College Riverside Campus. 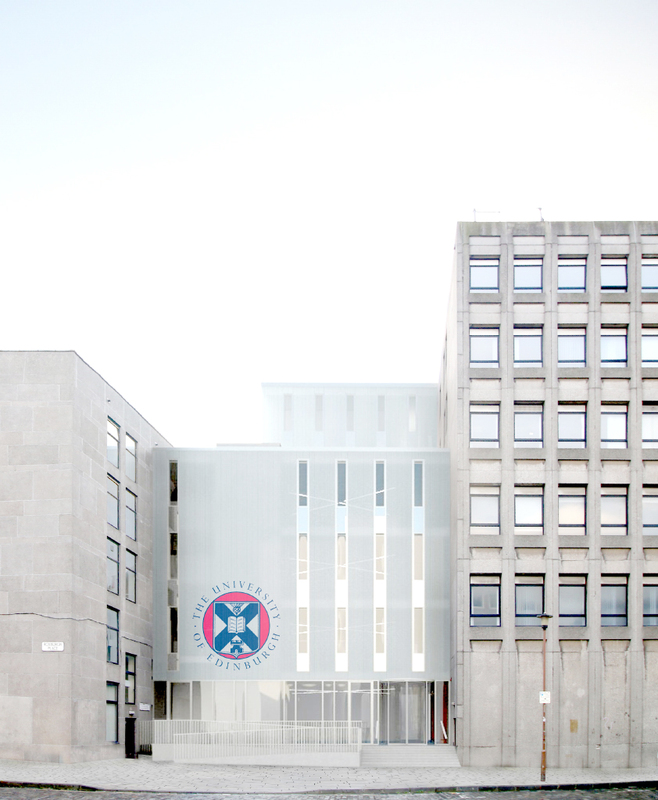 The building is the result of years of close collaboration, between the combined architects’ team of Reiach and Hall and Michael Laird Architects alongside interior designers Graven Images, principal engineers Arup and Hulley and Kirkwood, contracting team of Sir Robert McAlpine and FES and, most importantly, the college itself. For us, good buildings are only possible with good clients. We were extremely fortunate on this project to have a highly engaged and collaborative client group whose energy and commitment to the project went substantially beyond professional obligations. In the twenty years the award has been running, only eight projects in Scotland have been selected for the Stirling Prize shortlist. We are humbled to have taken two of these places and look forward to seeing what lies ahead for our Riverside Campus. Reiach and Hall are delighted to have been awarded an RIBA National Award 2016 for City of Glasgow College Riverside Campus. RIBA National Awards are the most rigorously judged awards for architectural excellence in the UK, and a building that wins an RIBA National Award sets the standard for great architecture across the country. “We are delighted to receive both an RIAS Award and a RIBA National Award for The Riverside Campus. It feeds the soul when a project that has been in our team’s minds [and hearts] for so many years is recognised at this level by our peers. 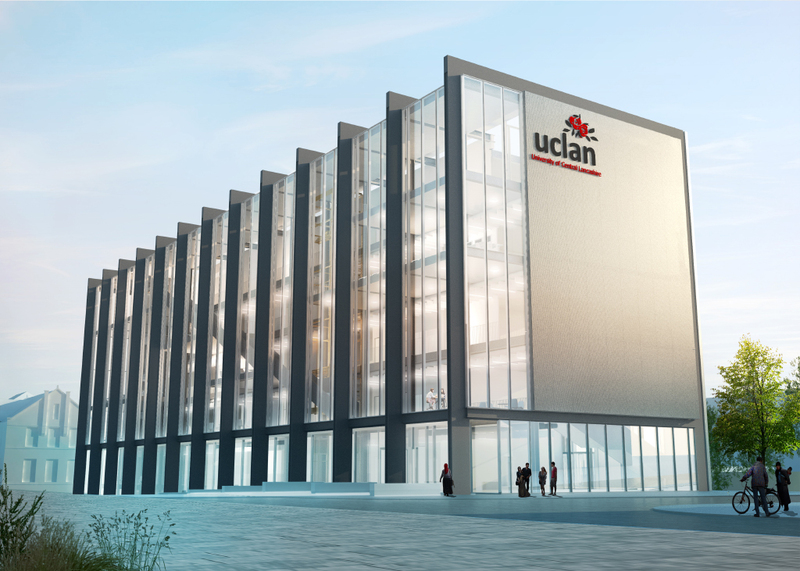 We are delighted that our proposals for a new £30 million engineering innovation centre at the University of Central Lancashire has received planning consent from Preston City Council. The new building, in the heart of Preston, was given the green light following consultations with community members and local stakeholders providing an invaluable link between academia and industry through its integrated teaching and research hub. “The approval for work to begin is an important moment for the University and the future redevelopment of Preston. The 2016 annual Scotblood Conference was held in Stirling University this month, with an excellent programme of national and international speakers discussing the current issues and future developments affecting the fields of blood transfusion, cellular therapy and transplantation. 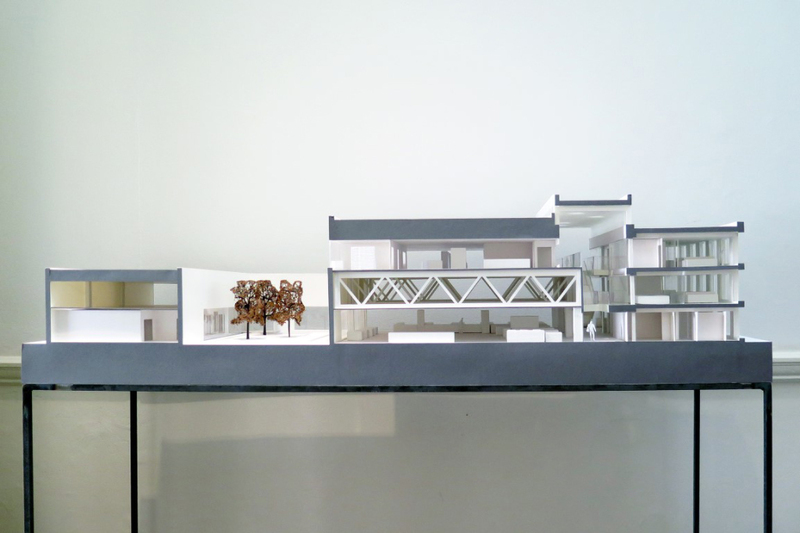 Reiach and Hall Architects produced a 1:50 scale model for display on the SNBTS exhibition stand – the cross section model captured the key spaces of the scheme, hopefully imparting an understanding of scale, the high levels of natural lighting and the linking of departments. The model cuts through: the 3 storey office block; the arcade and its principal circulation; the laboratories and blood manufacturing hall [separated by the massive trusses of the interstitial plant floor]; the courtyard and finally Tissues and Cells labs. 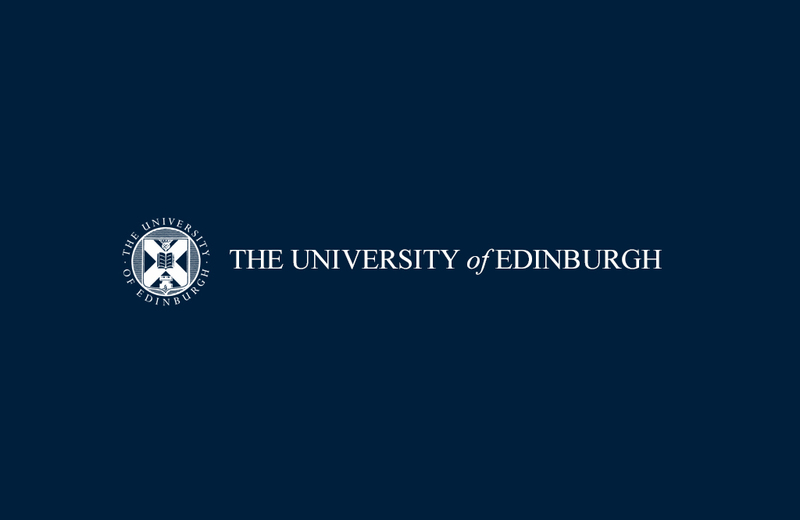 Reiach and Hall Architects have successfully secured two new jobs with the University of Edinburgh. The new contracts are both for an architect-led multi-disciplinary design team comprising Reiach and Hall Architects, Alliance CDM and Harley Haddow. The first project is to refurbish and fit out office space at Murchison House for Edinburgh Research and Innovation (ERI). The second project focuses on the fit-out of an existing industrial warehouse unit for use in the University Collections Facility at South Gyle. The building is currently split into four separate units, of which the University occupies two. We will look at extending the collections facility into a third unit. 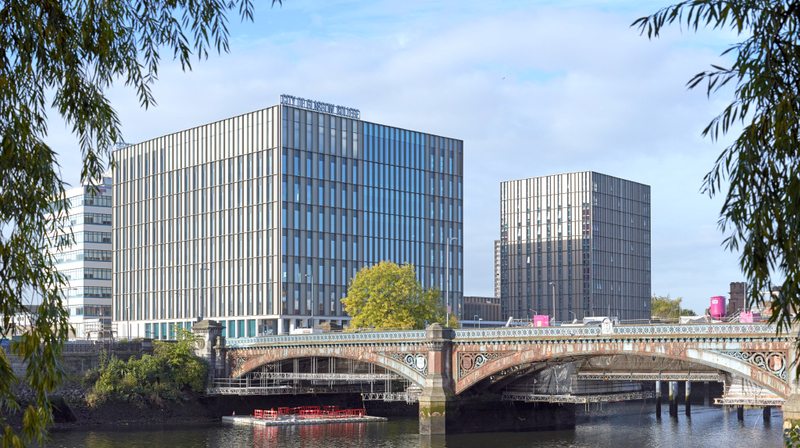 The City of Glasgow College’s Riverside Campus has been shortlisted for the 2016 British Construction Industry Awards, in the Building Project of the Year (£10m to £50m) category. The Riverside Campus, by Reiach and Hall Architects and Michael Laird Architects, represents an amazing team effort from all disciplines and we are delighted to move forward stage 2 of the judging process. The winners will be announced on 12th October 2016.